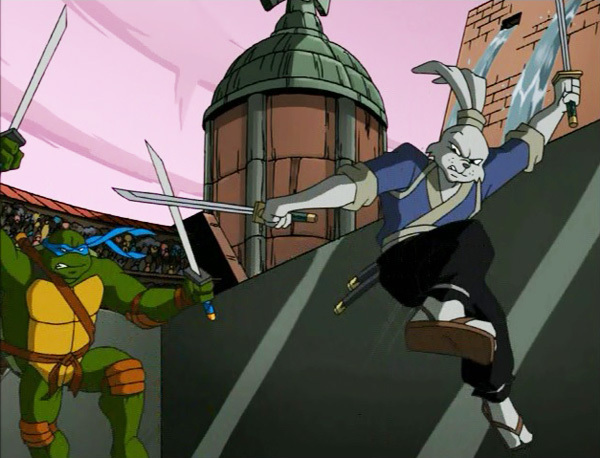 Usagi Yojimbo and Leonardo of the TMNT! Usagi has appeared in TV's Teenage Mutant Ninja Turtles several times since 1989. Appearing in both series (the first late 80s-90s version and the more recent 21st century version). Stan Sakai has always had a great working relationship with the TMNT creators Peter Laird and Kevin Eastman, even before they licensed out their creations as cartoons and toys. In fact, Stan has drawn several crossover stories with Usagi and the TMNT that he has said do in fact fit within normal UY continuity. Peter Laird has also drawn a TMNT/Usagi crossover of his own. The TV appearances, while not part of normal UY continuity, have helped Usagi reach a wider audience than ever before. Stan licensed Usagi and other characters through Mirage Studios for use in their animated programs as guest stars. 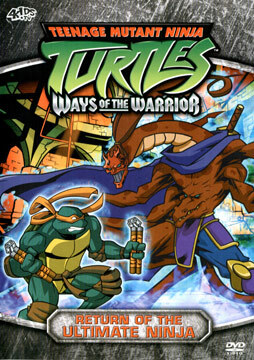 Usagi has also appeared as action figures in the TMNT toy line and has made appearances in the TMNT video games. 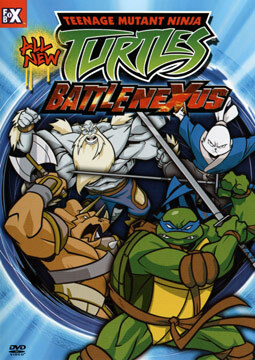 TMNT Volume 13: "The Battle Nexus"
As he does every three years, Splinter mysteriously goes off leaving his four boys at home. Where he’s going, he won’t say. Unbeknownst to Splinter, the four boys are curious and follow. Soon, they find themselves traveling through a dimensional gateway and in the middle of a fight... a fight that is part of a qualifying round... which is the beginning of the Battle of the Nexus, which we lovingly refer to as the Big Brawl. I think the TMNT are asking exactly what we’re asking: what the shell is going on here? 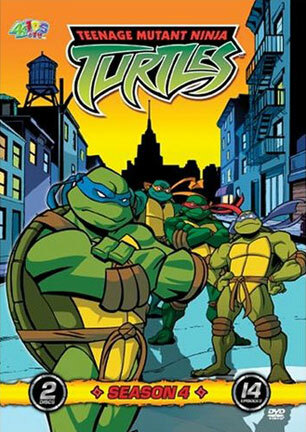 Finding themselves in an inter-dimensional tournament, our four teenage mutant ninja turtles discover a past about Splinter they never knew... that Splinter won the tournament they’re in years ago by defeating a malignant fighter named Lord Drako. And, our heroes are about to discover that Splinter’s past is about to collide with them like a speeding freight train! It’s down and dirty time. Splinter is imprisoned. Leo is dying of poison. Don and Usagi Yojimbo are fighting for their lives and the life of the Daimyo against a horde of assassins. Drako is about to gain big time power by getting his paws on the Daimyo’s war staff, and, worst of all (from Raphael’s perspective), Mikey’s poised to win the Battle Nexus Tournament and become Battle Nexus Champion. Things couldn’t possibly get any worse... or could they? Remember the bloodthirsty Triceraton Republic? You will! Interview with Peter Laird and Stan Sakai (the creator of Usagi Yojimbo). TMNT Volume 3.3: Ways of the Warrior "Return of the Ultimate Ninja"
A dreaded enemy from another dimension makes a surprising return, sending our four heroes spinning in different directions across multidimensional time and space! Separated from his family and his world, in what should be his superhero dream come true - but which turns out to be a nightmare - how the shell will Michelangeo ever make it back home? A dreaded enemy from another dimension makes a surprising return, sending our four heroes spinning in different directions across multidimensional time and space! Separated from his family and his world, forced by circumstance to become a wild and crazy Planet Racer, how the shell will Raphael ever make it back home? "Same As It Never Was"
world, trapped in a grim, dystopian alternate reality, how the shell will Donatello ever make it back home? A dreaded enemy from another dimension makes a surprising return, sending our four heroes spinning in different directions across multidimensional time and space! Separated from his family and his world, lost and surrounded by enemies in a realm which under different circumstances he could gladly call home, how the shell will Leo ever make it back home? Leonardo and a familiar ally arrive in the Battle Nexus hoping that perhaps the honorable Daimyo can help reunite him with his family. But not only does the Daimyo refuse to aid Leo, he has him imprisoned! It looks as if all hope is lost! form! A gang of young toughs, filling the void left by the rising Purple Dragons, is out to bash an Old Man to keep him from testifying against them. Nobody cares… luckily. Our vigilante cop, Nobody, enlists the aid of the turtles for a little witness protection program ninja style. Usagi and Gen come to New York for a visit with the Turtles. Gen gets a little carried away by the bright lights and big city and goes wondering off on his own. And if the modern world wasn’t dangerous enough, an assassin from Usagi’s world has followed Usagi and Gen here. His target: Leonardo. It is time for Leonardo to move on. Splinter sends Leo to a new sensei… or rather, a very old sensei. The journey is long and perilous. Can Leonardo look into himself and find the right answers to his questions? Can he even find the right questions? Hades hath no wrath like a scion scorned. Karai strikes with a vengeance. She physically invades the ultimate sanctuary - the lair! She crushes the Turtles' home and nearly crushes the Turtles, scattering them across town. Her only disappointment is that Leonardo isn’t there. She longs to destroy him most of all! Leonardo returns from his lessons with the Ancient One to find the lair destroyed and his family scattered across town… all by the hand of Karai. This will not stand. It looks like there’s going to be a showdown of masterful swords… a showdown between Leonardo and Karai. Something is growing and spreading in the NYC sewers and waterways. The remnants of Bishop’s ‘aliens’ have infected various animals, mutating them into horrible beasts ravenous for anything that gets in their way… including turtles! April receives a message from her long, lost Uncle Augie… who is trapped in another dimension. But, when April and Donatello use the artifact to travel to that dimension, they find Augie alive and well and living with new friends, who are intent upon visiting earth… and conquering it! Stockman has finally reclaimed his humanity by cloning a body for himself. Now, he is human once more… until his body starts to deteriorate and the changes undermine his sanity. Stockman’s broken brain fixes itself upon one paranoid delusion: April O’Neil is responsible for his downfall, and she will pay with her life! Evil demon sorcerer Savanti Romero is back! 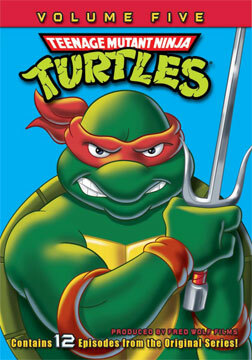 Back in time, that is – he’s stuck in the past but is causing trouble for the Turtles in the present day. Even with the help of Apprentice Timestress Renet (for what THAT’S worth), can the Turtles stop Savanti Romero from wiping out our timeline? Evil demon sorcerer Savanti Romero has lured the Turtles back to the Cretaceous period to exact his revenge, as well as get his hands on the Time Scepter. Forget about saying their timeline… can the Turtles save themselves from becoming dino food? Casey and April find themselves turtle-sitting a very ill Donatello. But Don isn’t merely sick; he’s actually in the final stages of a secondary mutation that will transform him into a savage beast… with an appetite for babysitters. Donatello is sick… mutated into a huge monster actually. His brothers’ only hope is to sneak into Bishop’s laboratory and acquire some sort of cure. But once inside, the Turtles find they’re in for way more than for what they bargained! The Turtles have made a deal with the devil… a.k.a. Agent Bishop. In return for curing Donatello, his three brothers have agreed to retrieve a pendant that is supposed to aid Bishop in his genetics work. The only problem: they have to steal it from Karai... and she won’t be giving it up without a fight!